One the primary reasons that soccer is the most popular sport in the world is that you need very little to play the game. Even when it comes to official practices at schools, the equipment list is not all that large for a player just starting out. 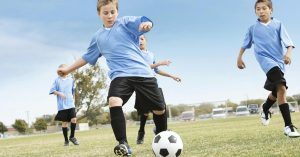 Here is a list of what your child will need when attending youth soccer practices. You will need practice t-shirts and shorts and socks. Usually, youth soccer uniforms worn when playing official matches are provided by the school. Ask the coach what sort of clothing you should get for practices as there might be a color preference. All official practice sessions will have a separate set of balls and accessories that the school uses.Buy a ball only for playing and practicing at home. Also, ensure that you buy the same ball that you use at practice. Spike Soccer Store carries FIFA approved match soccer balls, NFHS approved high school ball, futsal balls, training soccer balls and a variety of special surface and indoor soccer balls. Teach your child always to stay hydrated. He or she should have at least one water bottle. There are times when they will need more than one so keep a few ready. Usually, this is when there is not enough time to refill an empty water bottle during a break. A child won’t need soccer shoes or cleats until about eight or nine years old. Until then normal athletic sneakers will suffice. Once again, check with the coaching staff about when you should introduce proper soccer shoes to your child.